Today is the last day of our exploration of bridges over the South Fork of the American River and it's tributaries. Just as I still have a few more bridges to photograph on the North and Middle Forks, there are still several interesting bridges across the South Fork that I need to visit. 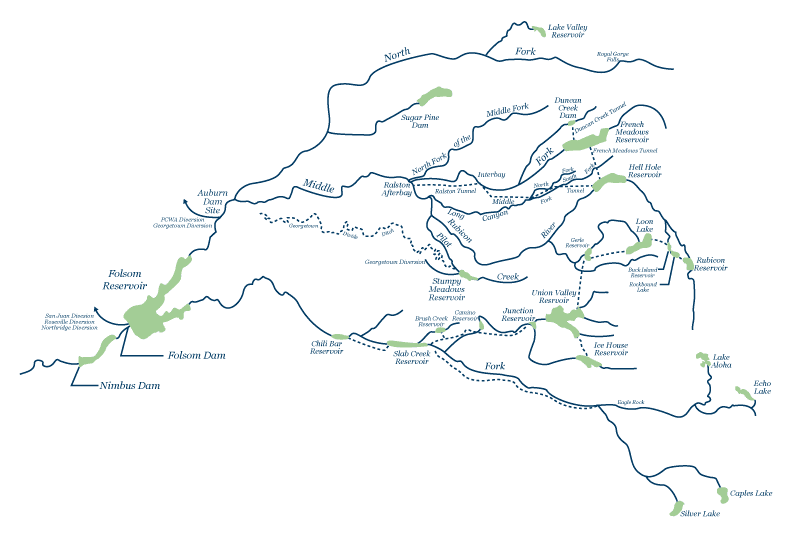 Perhaps this summer I'll spend a week trying to reach some of the more inaccessible bridges across the American Rivers. Today's bridge (a box girder on pier walls) is used repeatedly to carry State Route 50 from Pollock Pines all the way to Lake Tahoe. They are all called the South Fork of the American River Bridge but this one is Br #25-0008 in Riverton. They are all cast-in-place box girder bridges on pier walls with a minimum of architectural treatment and all of them were built around 1990. The highway and the river are both full of twists and turns and frequently cross each other. El Dorado County, California Bridges: State Route 50 Bridge across the SF of the American River by Mark Yashinsky is licensed under a Creative Commons Attribution-NonCommercial-ShareAlike 3.0 United States License.